Following a tip to law enforcement that identified him as a suspect, a 16-year-old boy, accompanied by his mother and lawyer, turned himself in to the Broward County Sheriff’s Office in Southeast Florida Monday to face a charge of battery on a person 65 years of age or older, reportedly confessing to the videotaped attack on an elderly woman at a pool party on Saturday that went viral on the Internet. Screen image from video of the attack on the woman. The boy, whose name was not published by local media, was quoted in a police report about his arrest according to the Miami Herald: “(the teen) “spontaneously uttered ‘I messed up and I have to own up to it. '” The Herald also reported the BSO received a tip via Crime Stoppers that led them to the teen. 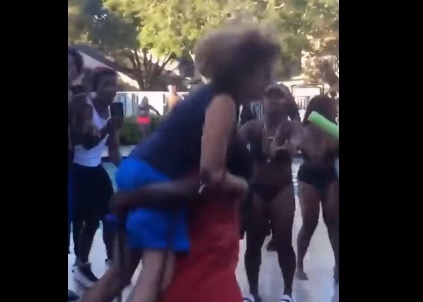 WTVJ-TV reported the 68-year-old victim, Nancy James, is the director of the board for the townhouse community, Players Place, located in North Lauderdale where the pool party was being held. James, who is white, asked the party attendees and DJ to keep the noise down and was attacked by a black male who slammed her to the concrete patio and then picked her up and threw her into the pool. Her two dogs she held on leashes did not end up in the pool and are reported to be fine. James suffered bruises but reportedly declined medical treatment the day of the attack. WTVJ reported James recently had hip surgery and had a stent implanted a week ago. James also has reportedly suffered three strokes. James told WTVJ she is not speaking to the media as she is still speaking with police about the attack. WTVJ also posted a video clip showing the 16-year-old arrested in the attack arriving at the Broward Regional Juvenile Facility. Two different versions of the attack have been posted online. The most well known version shows most of the incident and attack. The second is much shorter. The pool party was promoted by BlockBoyz, who denied involvement in the attack. The BlockBoyz deny involvement in the attack on the woman, “PSA IT WASNT A BLOCKBOY WHO THREW THE LADY”. BlockBoyz retweeted a video statement on the attack.